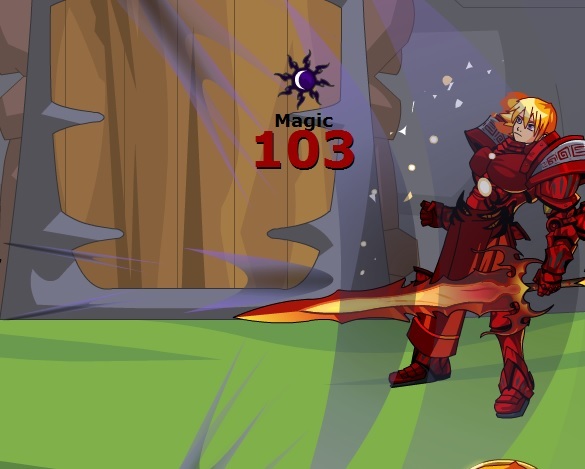 Say the magic words and the dreaded Darksplatter will smash your enemies with 10 hits of Darkness damage! June 10, 2008: The spell was released. June 8, 2012: Sellback was swept. Old value was 500. June 15, 2017: Sellback was swept. Old value was 3650. Location: Equipped on Zorbak when playing as him in Frostval '14: It's a Wonderful Life of Crime! ; the Well part of Death's Domain. *On top of the normal stat bonuses, the spell gets +CHA*3/80 stat damage, and +CHA/40 stat BTH. Don't tell anyone, but Zorbak can cast a few healing spells too! Deals *1.4 damage as compensation for the lack of appropriate equipment while playing as Zorbak. Four hits of *2/11 damage. 1 hit of of *3/11 damage with a +10 BTH lean. All this has ALREADY been factored into the below numbers. December 11, 2014: The spell was released.